Robert Matthew Van Winkle, known professionally as Vanilla Ice, is an American rapper, extreme athlete, and home improvement TV personality. His 1990 single "Ice Ice Baby" was the first hip-hop single to top the Billboard charts. After surviving a suicide attempt, Ice was inspired to change his musical style and lifestyle. While his later, less mainstream albums failed to chart or receive much radio airplay, Ice has had a loyal underground following. His latest album WTF – Wisdom, Tenacity & Focus was released in August 2011. 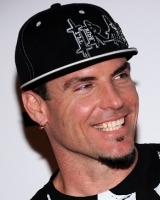 A successful real estate entrepreneur and a remodeling expert, Vanilla Ice began hosting The Vanilla Ice Project on the DIY Network in 2009. He published a book called Vanilla Ice Project—Real Estate Guide about succeeding in the real estate market. Vanilla loves to include the latest in state-of-the-art technology in his new houses and showcases them regularly on the show.